The authors automated testers continually patrol the Web to browse sites, download files, and sign-up for things with e-mail addresses. As you search, browse, download or register online, SiteAdvisor's safety ratings help you stay safe and in control. I hate a crappy and slow MCAfee antivirus , I don't use it now and I'm happy, but they continue to rip me off via their fraudulent siteadvisor.com website. Why MCAfee Site Advisor is a fraudulent service?
" -- How long does this re-assessment period last? --The re-assessment period can vary from as few as 10 calendar days to as many as 365 calendar days." Is it good for a real security? The URLs and files on modern websites are updated very often, so scanning a website once a year is completely useless and even dangerous and malicious practice. It may damage website's owners business and ruine the reputation. Of course, MCAfee doesn't care. Why? Well, I'll explaint that later. 2) MCafee siteadvisor is based on a reputation system, where random users are posting their comments with a site rating. That's a great chance for competition to publish a black PR feedback and reduce a competing website rating. Moreover, most users posting the comments there are mcafee BOTS - not people, which are given the most powerful rating 9/9, so you cannot even dispute their posts! What a crap, a machine revolution?? 3) MCAfee is interested to assign a bad rating to a website. First, more red sites - more scares, and their users can see, how MCafee software is useful to protect them - even if innocent website is blocked. 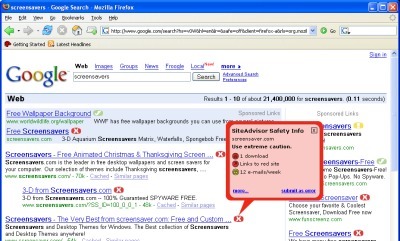 The most important part of that is MCAFEE EARNS NONEY on SiteAdvisor, although the end-user software is free. How? That's simple- if you don't want to see your site blocked by SiteAdvisor, you can PAY to mcafee to have a green rating "Tested daily by MCAfee". That green rating DOES NOT mean a 100% safe website for end-user, for example, I personally saw that refog.com website, containing a commercial spy software, had a green "Tested by MCAfee" rating for years!! Also the sites are scanned so rarely, that MCAfee ratings actually MEAN NOTHING. So who needs this useless website rating system? Only MCafee! MCafee is interested to put a red rating on your website! Actually, one of my websites has a red rating , and while trying to find out why, I've found out that some files listed as a "viruses" don't even exist on my website, and the date is from Sep 2009 , more than 6 months ago!! Also some of definitely innocent and proven downloads are listed as trojans and viruses! OK, I've contacted their support, they even replied me the next day, but NOTHING has changed, now a month after my request! I also saw that some well-known websites like www.snapfiles.com were suffering because of MCAfee blocking. There was also a story in some blog about a website owner, who stopped to pay to MCafee for a green rating, and after some time his rating was changed to yellow for no real reason! They remind "not forget to pay them"! 4) It's impossible to change the rating for website owner, even if it's assigned by mistake. They promise to "re-test it" in 5 days, but it will be never done. And I'm not alone with this. they still list the "malware" in URLs, which don't even exist for about a year. A great advice - stay away from this "security" scam, the main purpose of which is to steal your money. There are enough free solutions available - like Microsoft Security Essentials, AVG, AVast, Avira etc. Not all of them are great, but at least they are free. And actually the chance of being infected with something really dangerous is low, if you just learn a basic secrity rules of surfing the web! Find out more criminal facts about MCafee by searching Google for "MCafee fraud"! It used to be a good plugin when it would just notify, one of the updates made it a system app adding it to all browsers and making it do a lot of other annoying crap. Now I feel bad for all the users who's computers I've installed this on. Way to mess things up McAfee. Piece of crap. Good luck if you're a domain owner who has their domain slurred as "dangerous" by SiteAdvisor, because McAfee will ignore your pleas to have the rating undone, even if it was a mistake, even if the "malicious" download was never really "malicious", and even if you no longer offer it as a download at all. Well, great idea, except that it doesn't work. After having finally purged my PC of Virtumonde I'd contracted by clicking on a link in Goolge, out of curiosity I downloaded this extension and checked the link again. It said the site is safe! What? While not a proponent of McAfee's products in general, SiteAdvisor is well implemented. I particularly recommend this to my more timid clients that use Firefox. I had been reluctantly keeping this installed in my Firefox profile, but chucked it out once I realized that it broke another Addon 'Aardvark'. I didn't like it, but I think it is worth trying. It's been a while so I'm downloading it again. It's hard to rate accurately since I'm not really willing to intentionally go to the "bad" sites to fully test it. I might not have the optimal configuration, but my free tools work pretty wel: Firefox with NoScript, Ad-Aware 2007 free, Windows Defender, Windows Firewall and AVG Free are a good start. Read your router manual. Many routers do NOT require or even recommend software firewalls as they have hardware protection such as "Network Adress Translation" (NAT for short). You can usually google for a page that will analyze your internet security. Try "Test internet security"; Shields Up is one such web tool. Great piece of software, surfing with (a little) more confidence!! Anyone who counts on this as a primary security tool will obviously fall upon evil days, but that's not what it's intended for. It's merely an accesory in the secure toolbox, but as such, it does have value. I don't like or use other McAfee products, but this one works, and is unobtrusive. To anomoly: If you don't need the software fine don't use - why are you scewing the rating. Ive been looking for a nice phishing filter until FF 2.0 arrives and this program seems to do the trick. Better yet, there's no stupid toolbar add-on like the software on Mozilla's extension page. The notifier at the bottom of the page works well, the check for spyware is a great plus, and the warnings on google and yahoo are great. The program does exactly what it says it does - quite well in fact. Cool And Very Helpful Program! Used this for a day, no problems. Im sure once they streamline it , it will be great!